My name is Shawn and I’ve always been a scooter guy. My cousin gave me a Vespa 150 when I was 13 and I’ve been hooked ever since. I rode my scooter everywhere; the first few years in a clandestine fashion (playing cat and mouse with the police occasionally), but when I got my license I was out and about and was unstoppable. I took a long hiatus from riding to go to college, start a family and a career, but started up again in 2000. I never thought I was a “gearhead”. When I was kid I built models and flew gas powered planes. When I got our of college I started rebuilding houses with my wife as well as making the furniture inside. I’d always built and rebuilt things, mostly because of my New England thriftiness, and because I enjoyed the sense of accomplishment. 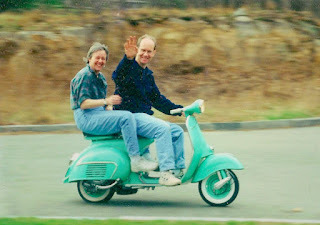 It wasn't much of a stretch when decided to tackle the restoration of my old Vespa. The tools and materials are different, but many of the concepts are the same. It also helps to be a perfectionist! Lambretta, bored to 190cc, chromed, electronic ignition. As reliable as you would expect a Lambretta to be!